So this story is definitely a fun super easy read. I actually completed it in two days. 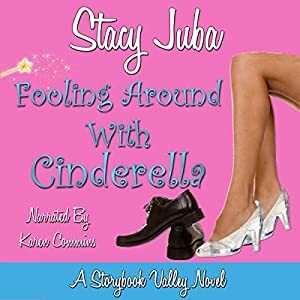 The story is about Jaine Anderson normal nerdy girl who after being laid off of her job applys for a position at Storybook Valley a dying amusement park kind of like Walt Disney Land. Even though there really isn't a position. There she meets Dylan Callahan the new General Manager who wants to bring life back into the family business. He decides to create a new position but the budget is not there until around November but there is a position she can fill in right now for some pay and kind of do some marketing work part time but she has to play Cinderella. Jaine who does really need a job decides to take it for one season. There she is thrown into all the drama of being a princess. Plus having an attraction to her boss helps too. The story is very cute and very predictable. You have the usual sterotypical characters. Nerdy Girl turns hot and the Bad Boy turned Good Boy. The originality of the characters weren't great. I wish there would be a little more with Jaine other then good girl who gets taken advantage of. The twin sisters being not the evilest but not nice either. Also even the villian is a old classmate . It is typical. Although as mentioned this is a fun read. I do look forward if there are more storybook Valley books because they are perfect on my mind rest days. (Usually this occurs when needing a quick pick me up or suffering from a major book hangover) . Overall pretty good. Despite the title I would say this is a very innocent YA. Other then the lack of originality of characters the other thing that disappointed me is the fact you never get anything from Dylan. On most of these Fun Reads you at least get a final chapter with the other character and I really wish this had it. I would love just one chapter in his mind. I never really got the full base of him. The book was very clear and I could understand what they were saying. Karen Commins was ok playing Jaine although at times I found myself wandering a little. Sometimes that happens though. I did receive this audiobook free in exchange for an honest unbiased review.